How to choose a college that’s right for you; what a daunting question! The good news: there are more than 4,500 colleges and universities in the US. Even better news: most schools accept most students, with the national average at 65.8% in 2014 (source). But which of the 4,500 is right for you? High school counselors can be a wonderful support during the college process and many specialize in developing lists for choosing the best college. There are also many private counselors who can help you develop a list. (Find one near you here and here.) But if you have yet to schedule a meeting with your high school counselor (get on that!) and you can’t afford a private counselor, this article will show you how to develop a great college list online. For free. So what are all the factors for choosing a college? Now that you’ve got the basic idea, let’s begin. WHat qualities am I looking for in a college? When I asked Steven Antonoff, who literally wrote the book on finding colleges, for the best way for students to spend one hour discovering their college preference, he advised going somewhere quiet, like the top of a mountain, and really thinking about two things: who are you and what do you want? That could work, if you have a mountain nearby. But if you don’t happen to have a mountain nearby, I recommend the 80-question “Self-Survey for the College Bound” in Steven’s book, The College Match. And he’s not paying me to say that. But if you’re unable to buy the book (or just too lazy) and just want the worksheet? Get this: he gives it away on his website. These aren’t meant to be exhaustive, says Dr. Antonoff, but instead meant to start a conversation. Complete these exercises over the course of an afternoon and you’ll have begun that conversation. What are some other ways to get to know your interests and preferences? Dr. Antonoff and I both like Do What You Are and I’m a big fan of YouScience. I also recommend the “Sizing Yourself Up” section at the start of the Fiske Guide to Colleges (more on that in a moment) and on the podcast, Dr. Antonoff mentions a half-dozen other great self-exploration tools, including Knowdell’s card sort, the True Colors survey, and O*NET online, all of which you’ll find links to on the show notes page at this link. Where do I start finding the right colleges? Once you’ve done a bit of self-discovery with the above exercises, I highly recommend that you use collegexpress.com to search according to your interests. Why College Express? Because after 30 years spent eating, sleeping and breathing colleges, Steven Antonoff published his amazing set of lists in his book The College Finder, but they are available (and searchable!) at www.collegexpress.com. So you can type in anything from “Schools for the Free Spirit” to “Great Private Colleges for the B Student” and you’ll get results. Another thing I love is that Steven doesn’t rank schools, which is pretty tough to do anyway. Wait, shouldn’t I just be trying to get in the most prestigious and highly-ranked school? Nope. In fact, choosing which schools you apply to and attend based on prestige and ranking alone can be a pretty bad idea. Why? The most popular rankings like US News & World Report rank colleges based on a very specific set of factors, and very few of those factors actually impact you as a student and the kind of experience you will have in college. Also, by applying to colleges using only the US News and World Report, you are basically trusting that you value the exact same set of qualities that are used in that ranking. Fun fact: In 2011, 20% of a school’s ranking was based on graduation and Freshman retention rates. Here’s a confession: I have yet to meet a single student who has said that freshman graduation and retention rates are an important factor in their college selection process. If you’re interested in reading more, check out Malcolm Gladwell’s analysis of the US News & World Report rankings here: The Order of Things: What college rankings really tell us. Finally, there is a big misconception that the college you go to will have a big impact on your career opportunities. While that might be true in the past or in other countries, that just isn’t true for 99% of career paths in the US. Even top companies like Google no longer focus on the prestige of your degree, and they now focus more on your knowledge in the field, applied skills you’ve developed, and relevant internship experience. But unfortunately, that fact hasn’t caught up with the general public and many people believe prestige matters more than it might. So how do I figure out which schools to apply to? Good question. After completing the self-discovery exercises above, you’re ready to start your research. 1. First, download and make a copy of my Ultimate College List Research Tracker. Trust me. It’ll help you stay organized. 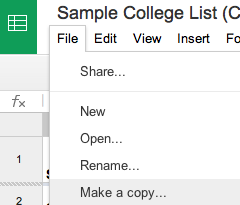 Once you’ve downloaded it, go to “File” and click “Make a copy...” so you can have a version that you can edit and add colleges to. 2. Begin to research colleges using the resources below. As you are researching, start to notice which colleges are coming up repeatedly. Example: maybe you’ve never heard of Brandeis, but you see it on the lists for “Colleges with Excellent Political Science Programs,” “Colleges with Fine Music Programs,” and “More Colleges for Creative Writers” (and you want to major in Poli Sci, you play the violin and like to write poems in your spare time). 3. Type your list of schools into that document as you research. Even if you don’t know if you’ll eventually apply to the colleges you come across in your research, put it on your list. In fact, put 15-20 colleges on your initial list. You’ll whittle it down over time. How? Through research. Share this list with anyone who is helping you (your counselor, friend, or parent) using the “Share” button in the top right corner. So Where should I research colleges? For the pro perspective, check out the Fiske Guide to Colleges, which is (ask any counselor) the go-to guide for college research. It has great 2-3 page summaries of hundreds of colleges and is a great starting point. Why else should you get this book? You’ll find out in podcast episode #110 with the author Edward Fiske, which you can listen to here. For the student perspective, go to unigo.com where you can read real students’ opinions on their schools. But don’t just read 1-2 reviews, read a bunch of them, in particular the “What’s the stereotype of students at your school?” and “Is the stereotype true?” You’ll get a sense of the school vibe pretty quick. For virtual campus tours, check out YouVisit, one of my favorite websites for taking campus tours. They even have Virtual Reality tours if you’ve got a phone that has VR capabilities. Or, you can just go to YouTube and search “college name campus tour” and you’ll get tons of video tours, and sometimes specialized tours of specific programs or buildings. How do I know my chances of getting in? In general, it’s tough to perfectly predict your chances at getting into any college. Even for schools that you feel are clear “maybe” or “match” schools aren’t always sure bets. Why? Colleges often have institutional goals that they have to meet that you have no control over and are tough to predict, including ensuring that they admit students to certain majors, from diverse backgrounds or geographic areas, like in-state vs. out of state. This is why it’s super important to have a balanced list of colleges, and the four categories I’ve outlined above are a good guideline. But rather than spending endless hours debating whether a school is a reach or a wild card, it’s best to use general acceptance rate, GPA, and test scores as a good guide in deciding whether a school is a Wild Card, Reach, Maybe, or Match. Here are a few of my favorite tools for assessing your chances. In general, regardless of your GPA and test scores, a college with an acceptance rate below 10% should be considered a Wild Card for almost everyone that applies. Cappex provides a great tool that allows you to input your weighted and unweighted GPA, your test scores, and your college preferences, and it will match you with schools that meet your preferences but will also provide a rough sense of your chance of admission. Bonus: Cappex also will give you the average Net Price paid by students (which is different from the sticker price) as well as the merit scholarships that are available at each school to which you are applying under the “Scholarships” tab. This will show up once you’ve added your colleges on Cappex. CollegeData, as its name suggest, has TONS of data on the average test scores, general acceptance rates, and average GPAs of incoming college freshman. But it also provides great data around average financial aid packages offered, specific financial aid packages offered to students who were admitted, and loads of other numbers that might help you and your family plan for college costs. Keep in mind this is mostly self-reported data, so use it with a grain of salt. Naviance (ask your counselor if your school uses this) often has helpful scattergrams that will show the average test scores and GPA for students who applied to certain colleges from your high school school. Keep in mind that these scattergrams only include a few data points. Just because the average GPA and SAT scores for students getting into Brown at your school was 3.85 and 1510, that doesn’t mean Brown is a target school if you meet those numbers. Scattergrams don’t include important data like extracurricular involvement, the quality of college essays, legacy status, intended major, or other factors that can be super important. In addition, the data may be more biased towards acceptances since students tend to be more likely to report their scores and GPA data when they are accepted, rather than denied. While it can be helpful, it should just be one of many tools you use in assessing your admissions chances. How do I know if my list is finalized? Keep researching until you’re in love with all of your colleges – yes, even the “Match” schools where you’ll likely get in. How much you end up actually researching depends on you, but I recommend spending at least an hour on each college that you add to your list. Want more college Research help? Listen to podcast episode 109 with Steven Antonoff (Author, College Match and The College Finder) and episode 110 with Ted Fiske (Author, the Fiske Guide to Colleges). Want to download a PDF of this guide? a few College Lists to get you started..